Strategies pertain to long-range goals, or a basic posture one means to maintain over a long period of time. Tactics are plans of what to do from moment to moment. In this chapter and the next I set forth the strategies and tactics known to me, that I personally use. There’s no end of irony in that I write this now not based on what I have accomplished, but based on what I have yet to accomplish. I myself do not yet do these things. Seek peace, and you will find it — or create it. Seek turmoil, and you will find it — or create it. The Way of Peace entails seeking peace. One may face dozens of decisions each day, between a path that will maintain or enhance one’s peace of mind, and a path that would destroy it. It can be as simple as choosing a self-affirming, self-loving act over a self-destructive one. It can be a choice of attitude towards a project or a relationship that may occupy one’s attention for hours or days. In “the rooms” of the Twelve Step movement, we speak of changing “people, places and things.” People, places and things that were associated with one’s former life of addiction, may need to be sacrificed in order to maintain one’s recovery — one’s newfound peace of mind. Don’t go back to the corners you used to hang on, let alone the bars you used to hang in. Give up activities that used to accompany your drinking or drugging; find new ones. Old friends who used to egg you into self-destructive activities, aren’t likely to be friends to your chosen, new and better course in life. A change of spouse may be necessary. This is not at all unusual in the recovery movement. The tantrums and turmoil one used to create, while in one’s active addiction, may have left the spouse so emotionally (and/or physically and/or financially) scarred, she or he cannot cooperate with the new self one seeks to be. Given something like PTSD, the spouse may be unwilling or unable to forgive, but instead keep reminding the recovering person of her or his past offenses and behavior patterns. To maintain peace of mind, one may need to get away. Permanently. Noir film or literature: Scenes of torture, betrayal, and evil schemes I would never have thought of on my own, are not consistent with the way I want to think about people. WERQ: The only radio station one heard anywhere in Barclay, it was everywhere, spewing forth material produced by and for gangsta wannabes. Ta-Nehisi Coates: Currently the darling of the American intelligentsia, he seems to champion exactly that values system most prone to keep the black man bankrupt and in jail. That’s not what I want for the black man. Critical theory, including critical race theory and critical gender theory: As I am more oriented towards feelings than ideas, these systems seem to me to be all about deconstructing others’ hopes. I want to create hope, not deconstruct it. Many times, one can simply choose to be happy — just wish it, and one will be there. More often, one faces choices among different courses of action or ways to look at things — some of which are more likely than others to let one feel happy, or to bring happy results. It is wise to choose the course of action, or the point of view, most likely to leave you feeling happy. Even in very little things, in minor things, it matters. 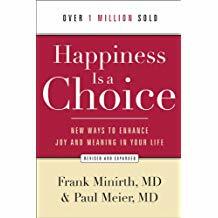 Circa 1985, Frank Minirth and Paul Meier produced the landmark Happiness is a Choice. It is chock full of strategies and tactics, and even exercises, to help one learn to consistently choose happiness. I never read it myself, because it’s written from a perspective of Biblical inerrancy, which was sure to offend me again and again. But it is revolutionary. Look at opportunities, not obstacles. Stumbling blocks can become stepping stones. Almost every cloud has a silver lining somewhere. The novel Pollyanna told the story of a relentlessly optimistic girl. Years ago, I was fearful of becoming “pollyanna” — relentlessly optimistic — because I supposed it involved denying that the cloud exists, denying that bad things ever happen. In fact, it involves instead a radical acceptance that bad things do happen, and a choice to move through, rather than dwell in, the grief and get on with life. Opportunities for grief are and always will be available. There will always be a reason to feel sad or angry. The question is how often, how much and how long one will choose to feel that way. It works. And in almost any situation, replacing bad feelings with good ones is a good thin in itself. It’s worth it. It leaves one in a better position to deal with the grief one can’t help but feel, and to move on, making positive decisions for oneself and one’s neighbors. Related: I will not be disappointed. Thought control starts with selective thinking. If there is a thought that should be avoided, do not entertain it. Some have tried to destroy thoughts by fighting them. This is not a success­ful method. The way to overcome unwanted thought is to think its opposite. In this way hope replaces despair, confidence re­places fear, success takes the place of failure and faith takes the place of doubt. What is an opposite thought? Worrall was an engineer by trade, and so oriented more towards thoughts and ideas than I am. I am more oriented towards emotions and feelings. Note that the changes speaks of — hope replaces despair, confidence replaces fear, faith replaces doubt — are actually changes of feelings, not thoughts. In silence, the normal way to deal with a negative thought or feeling is to just let it leave your experience, like a stray piece of paper on the sidewalk that is blown away from you by the wind. From time to time, however, some mass of bad feelings may come that seems like it just won’t go away, no matter what you do. A visualization like this one can be useful in such a situation. Visualize a pile of firewood. As a child colors in the spaces in a coloring book, fill up this firewood with all the bad feelings. Pour the bad feelings into it. Add more firewood to the pile until you have enough. Let the images become as vivid as you can make them. Feel the weight of new logs in your arms as you carry them toward the pile. Pick up some of the pieces, feel how hard they are, how heavy they are. Tap one piece against another, and hear the thunk, thunk as you do so. Then set the thing on fire. Watch it burn. All the bad feelings that you poured into it are now there, rather than in you; and the fire is changing all that material into light, warmth, and heat — which you can choose to be positive feelings, optimism, comfort, love and joy. Watch it until the firewood is all consumed. Then the bad feelings will be gone. One can use whatever before-and-after images one likes, “from” whatever ugly image may symbolize one’s ugly feelings, “to” whatever lovely image may correspond to one’s desires; with the substance involved changing — substantially — as one makes the change. One who practices Presence becomes able to do all this without having to enter silence and without having to imagine. When I attend enough to becoming upwardly mobile myself, I often find myself looking down on the men around me now. I don’t want to look down on anyone. These are (mainly) good guys. These are friends. So this a learning opportunity, a growth opportunity. It appears to be a common problem for folk who seek upward mobility. I find this morning that perhaps I can sublimate or incinerate those feelings as they come on, burning up emotional filth to release light and admiration for guys who, after all, are doing the best they can with the resources they’ve got, and whose motivations no one can gainsay. Free Speech Handbook Guideline No. 7: Don’t change the subject. In a recent classic case, unable to refute Emma Gonzalez on the question of gun violence, Steve King accused her of being allied with communist Cuba. I’ve been thinking a lot lately about how I, as William Tell, will respond when people say ugly things. Sometimes I myself may change the subject. On one occasion sometime between 1983 and 1990 — I can recall where I was living, but not where I was working — I came home from work and became suicidal. I don’t recall the basis of my agony, but it almost certainly pertained to certain foibles of “the flesh” that my “spirit” seemed powerless to overcome. A former student had left a cassette tape at my door that day, full of music he wanted to share with me, beginning with “Bad” by U2. I had a second floor apartment, and had sometimes heard this from the boom boxes of people who walked by outside; and I knew what effect it would have on me, particularly the opening section, with the bells. Given my state, for that reason I intentionally delayed playing it. When I couldn’t bear the pain any more, I put it on, and was at once transported from the pit of despair into a place of perfect peace. I count this as a case of divine intervention: by means of that young man and that music, God saved my life.